Despite the reshifting of values that has affected every aspect of life in the 21st century, William Shakespeare still stands as the greatest writer the English language has ever produced. Even so, many people have never read him. 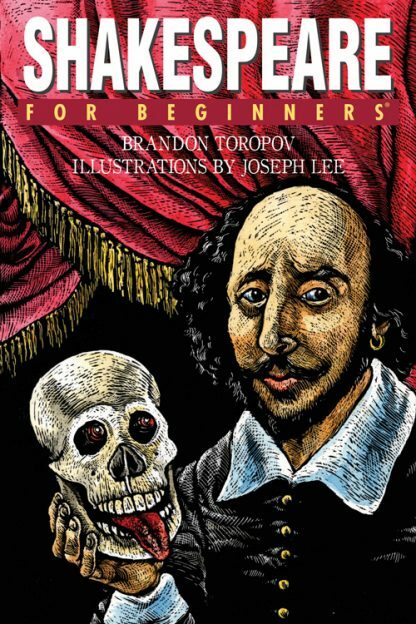 If you have never read �the Bard��or if you�ve tried and given up in frustration�you need Shakespeare For Beginners. Author Brandon Toropov opens with the observation that Shakespeare�s genius is not in his (or England�s) history, it�s in his words, most notably, his plays�in his brilliant stories, unforgettable characters, and the impossible beauty of his language. So, Shakespeare For Beginners skips the historical foreplay and goes straight to Shakespeare�s plays. The book offers clear, concise descriptions and plot summaries of each play; it lists key phrases and important themes, explains the main ideas behind each work and features excerpt of important passages (with explanatory notes on tough words.) And it is the only �entry level� book available outside Great Britain that covers all of Shakespeare�s plays. Brandon Toropov is a playwright, author, and confirmed Shakespeare fanatic who lives in Massachusetts. His plays include "Seven Affidavits on Authority", produced in Boston and Providence, Rhode Island, in 2000; "An Undivided Heart", workshopped at the National Playwrights Conference in 1994; and "The Job Search", produced at the Manhattan Punch Line in 1987. As an actor, he has performed in productions or adaptations of "The Tempest", "A Midsummer Night�s Dream", and "Macbeth". He has authored over a dozen books on popular culture, business, and religion, including Who Was Eleanor Rigby?, The Complete Idiot�s Guide to Urban Legends, and The Complete Idiot�s Guide to the Koran.